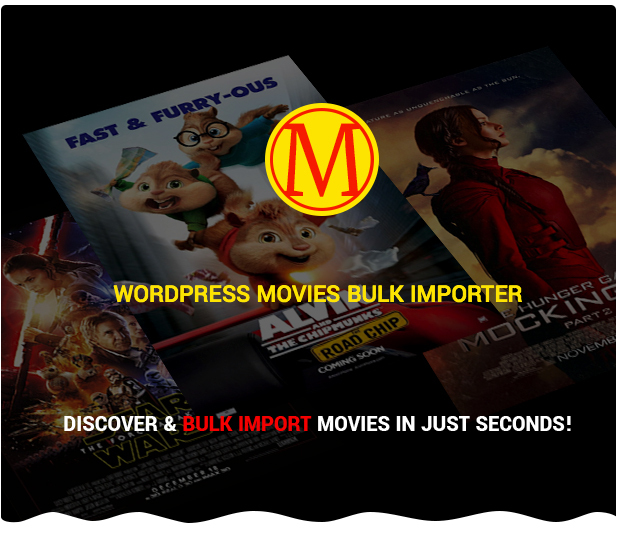 WordPress Movies Bulk Importer allows you to instantly bulk import Movies from the Biggest Online Movie Database. Get cast info, cast biography, genre, actors, directors, release date, trailer and many more with just a few clicks. You’re a Movie Fanatic / Enthusiast and you want to build a Movie Blog Featuring Latest Movies, Movie News, Top Rated Movies, Movies with Trailers & more? Then this plugin is the perfect choice for you! Looking for a way to monetize your website also? On each movie you import you can search and display amazon products that are related with the movie. That way you will earn commissions from Amazon Affiliates in no time! If you’re curious what movies & actors are popular on your website you can check out Top Movies & Top Cast Actors based on user views in the Plugin’s dashboard. – Advanced search – here you can search movies by genres, language, sort them by popularity, release date, original title, revenue & votes ascending or descending. You can choose to import adult movies or not. Setup how many movie pages to import – limit is 1000 pages. Setup to automatically display Amazon Related Products on each Movie Page, that way you customers can buy from Amazon a copy of the movie you’re featuring on your website. This feature is great for marketing, and it also gives you an extra opportunity to earn some money from Amazon Affiliates. A custom movies page is automatically added when you install the plugin. The page contains a custom search for movies, a custom filter (you can filter by recently added movies, by name a-z & premiere date) & you can also watch a movie trailer from the movies list page. You can also filter movies by cast, more specific by actors. You can filter and see in which movies an actor plays in. Movies can be filtered by genre also.